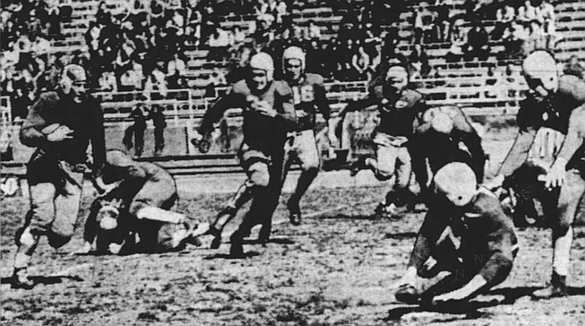 Wayne Blue gains 10 yards for "Yale" in 1939. We now know the first Nebraska football spring game probably occurred in 1922. But what about the subsequent years leading up to 1950, when the university’s official recognition of spring games begins? Depending on one’s criteria, there were spring games in as many as 22 of the 28 seasons from 1922 to 1949. Our year-by-year rundown started with the 1940s. Below are the ’30s, and the final installment will cover the ’20s. All games were played at Memorial Stadium unless noted otherwise. 1936.04.04 (SAT): The Reds dominated, scoring six touchdowns in a three-way game with the Whites and Blues. Neither the World-Herald nor the Journal & Star gave a score, probably because of the rotation between Reds vs. Whites, Reds vs. Blues, and Whites vs. Blues. The Daily Nebraskan gave a score of Reds 44, Whites 0, even though some of those 44 points were given up by the Blues and/or scored by the Whites. 1937.04.17 (SAT): Is it a true spring game if fans can’t attend? A 60-yard touchdown gallop by John Howell was the highlight as the Reds hammered the Greens, 26-0, “behind closed gates” at Memorial Stadium. The Daily Nebraskan said first-year coach Biff Jones wanted an “unscouted” contest. 1938: The scheduled game of Saturday, April 16, was canceled because of a swampy field. Players instead practiced inside East Stadium for two hours.